About the time you think Americans and can’t get any loonier, we have a “week that was” filled with days that seem to fast-forward into the past. For Joy and I, unknowingly we experienced a fast-forward into the future event back to April of this year when during a visit to San Antonio we were strolling by the Alamo. All around us, Crews were setting up a large stage, with plenty of lighting. What we first figured was part of Fiesta Week, beginning the next day, However, the more we looked around, it became evident that this was a Fox Television choreographed Glenn Beck production of a Tea Party event to go live that afternoon. 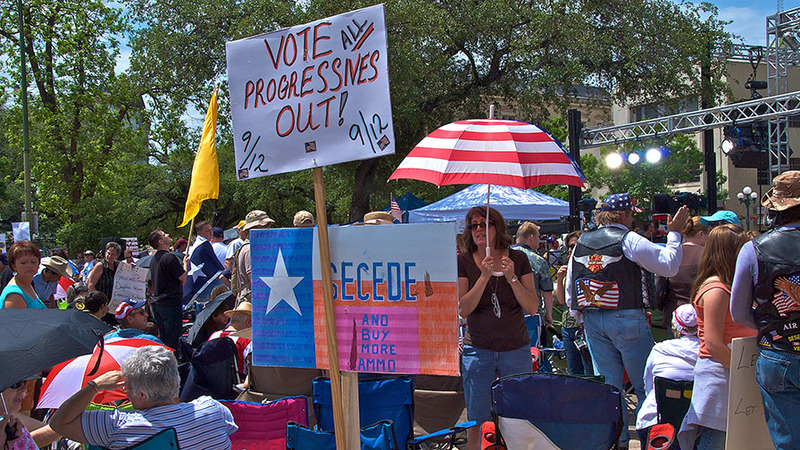 Not knowing much about Tea Party events, we came back that afternoon to witness people professing their patriotism by pushing lies. The rhetoric was real, but the reality was scary, so much so, a state trooper admonished me as we tried to exist under yellow security tape. The looniness continued throughout the summer; now into the first week of September with claims, the president was indoctrinating schoolchildren, and Rep. Joe Wilson screaming, “you lie,” in the middle of President Obama’s address on his health care plan. Although Wilson was wrong, the outburst was a continuation of Obama’s opponents using slogans short on substance, but long on spectacle. What seems to have been lost in all the media coverage of the spectacles is the misguided refusal for many on the right to accept a duly elected president as their leader. As blogger wrote on his blog: “What has been at work since the young African-American from Illinois made political history last year is far more malevolent than not liking him or his policies, and try as I might factor out Obama’s skin color when it comes to his most strident critics, I just can’t see someone like Wilson — who after all crusaded to keep the Confederate flag flying atop the South Carolina statehouse — behaving badly if the president was a white guy.” How else can one explain away signs at yesterday’s containing some of the following words: Adolf Hitler, Osama bin Laden, Saddam Hussein, Joseph Stalin, King George III, Satan, The Anti-Christ, Socialists, Communists, Marxists, Fascists, Liar, Racist, Scam Artist, False Messiah, Kenyan, Muslim, Jew, Terrorist and others. Click here to see photos taken at yesterday’s 9/12 event in Washington DC. You might be interested in The Glenn Beck Review at http://sharethisurlaboutglenbek.workpress.com, the preeminent blog for Beckology.